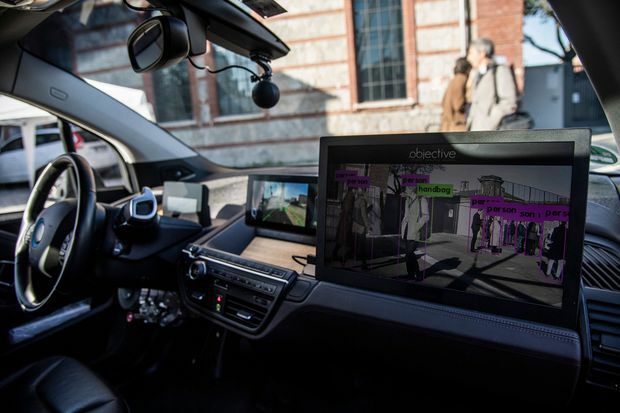 The autonomous driving technology developed by German software and hardware engeneering company "Objective" is pictured in a car during a series of tests with passengers but without an acting driver in the city centre of Turin on Nov. 27, 2018. Joe Atikian is the author of Industrial Shift: The Structure of the New World Economy, and Cuba Under Embargo. Self-driving cars struggle with simple moves such as merging into traffic or turning left, and yet it seems to be a forgone conclusion that they will eventually take over from human drivers. Billions of dollars are being invested and new laws are being enacted to support development of autonomous vehicles, but challenges still abound. One answer might be to restrict self-driving cars to routes with controlled intersections, but this wouldn’t address other dangers such as safely driving across sidewalks to access driveways. Cities could reconfigure infrastructure to suit self-driving cars, but only at an exorbitant cost. A far cheaper path would involve restricting pedestrians and bikes from all access routes that intersect public roads. But that would be a recipe for conflict. So how will cities and this new technology adapt to each other? An interim technology such as Level 4 autonomy could help. In this case the car requires a human driver who can take control when needed. The whole concept of efficiency is destroyed, but it also gets worse. The driver must remain in supervisory limbo and yet somehow stay alert in case of a sudden emergency such as a child bolting in front of the car. Such drivers will be saddled with an impossible responsibility, and may not be able to do the job in a reliable fashion. With fully autonomous cars, the legal liability for fatal collisions has yet to be addressed. Who is to blame? Is it the car maker or the car owner? If a driverless car hits a black-clad pedestrian invisible in a nighttime rain, who will be held legally responsible? The usual course is to determine the outcome in a lawsuit. Even if the government creates legislation with great foresight – which never happens – the first few suits will be appealed to the Supreme Court, which might take years to resolve. Meanwhile, vehicle engineering will continue producing more new unlitigated technology that would only add to an ongoing muddle. In the United States, a conservative-leaning high court may well side with the Giant Car Company of America, meaning that the car owner will bear legal responsibility for the car’s behaviour. Arizona recently stepped up to promote itself as a driverless hub in the United States. The wording of the governor’s 2015 executive order suggests that its rationale is biased toward economic gains as opposed to safety concerns. It may also suggest that the legislative future already tilts against car owners. In a similar vein, the U.S. House of Representatives passed the Self Drive Act that provides some exemption from safety standards for each car maker’s first 100,000 driverless cars. The future of driving need not become a robot-driven drama in which car owners take most or all of the blame for their vehicle’s behaviour. Consider the technology already in place for vehicles in fully controlled settings, such as trains or subways. These vehicles run on fully restricted access roadways (rails) equipped with automatic signal systems for the driver, and yet collisions between trains still happen. The presence of a driver is not enough to prevent an accident. Instead, these deadly events are almost completely eliminated by collision-avoidance braking systems wherever they are used. Braking is the key. So it’s clear that our cars need automated brakes as well as fully engaged human drivers more than they need total autonomy. The best part is that this technology can be implemented very quickly with benefits flowing to the public instead of waiting for some undefined future court challenges. So far, the handful of deadly crashes with self-driving cars are isolated events. That’s because each of those cars was alone in a world of human-driven traffic. Who is to say how that will change in a sea of Level 5 fully autonomous cars? How will those autopiloted cars react to other cars on autopilot? If one car swerves and brakes to avoid a dog at an intersection, its neighbouring cars will swerve and brake too. Collisions and blame could multiply instead of being averted. Should we accept the technological benefits along with unfair liability? The solution to this technological dilemma can be straightforward. Implement the features of driverless cars that are most urgently needed. Fully autonomous cars reduce the risk of driving by eliminating excessive speeding. They do not have a driver, which also means no drunk driver. But nothing stops us from implementing speed-limitation and drunk-detection systems in next year’s human-driven cars. Combined with automated emergency braking, the vast majority of problems can be easily solved without rushing to introduce a suite of new technological and legal problems.